The Brockley Jack sees many productions, yet for me it is always those that are bleak and dark that work the best in this intimate space. Those with fewer actors add to the tension, with the audience’s focus never leaving each character, constantly scrutinising in an attempt to understand them. Arrows and Traps are magnificent in their adaptations of beloved classic tales, pulling stories apart and reconstructing them in ways that analyse the symbolism and present a new perspective on the author’s work. Dostoyevsky’s Crime and Punishment is no different, unravelled and twisted throughout by artistic director Ross McGregor in this adaptation by Marilyn Campbell and Curt Columbus. With a small cast of three, the story is told with overlap of scenes being relived, once they have been mentioned, in a surreal flashback scenario. This allows those unfamiliar with the story to guess who might have done what to whom, with Raskolnikov’s unreliable reconstructions adding to the mystery of the tale. Dostoyevsky’s themes of politics, crime and absolution remain, but the story seems somehow darker and more intense. 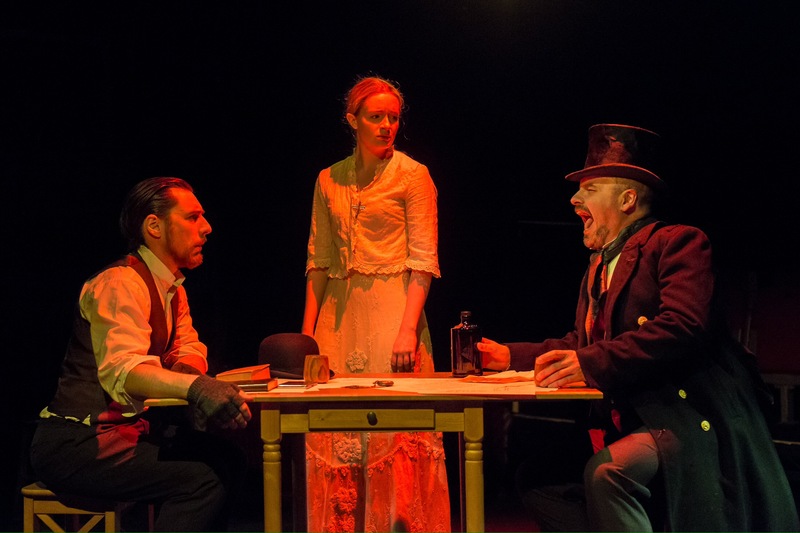 The three actors are perfectly cast, with Christina Baston’s vulnerability as Sonia complemented by the tortured soul of Christopher Tester’s Raskolnikov, whilst Stephen MacNeice gives a strong performance as Portiry. Both Baston and MacNeice play multiple roles, allowing them to tackle very different characters and show the true breadth of their acting ability. As Raskolnikov, Tester begins composed, albeit bitter, but we see him transform into a broken man, struggling to have his beliefs understood, as he torments himself with what he has done. His performance is impressively terrifying as he falls deeper and deeper into his belief of what is and is not justified. Trying to condense Crime and Punishment into just 90 minutes (with no interval) is no easy task, yet the second half of the play did lack the easy speed and flow of the first. That said, this is a thrilling production that once again brings a classic novel to the stage in an intelligent, yet approachable way and leaves the audience questioning their own views on what extraordinary really means.